Early Friday temps in the mid to upper 60s will rise into the lower 80s by the afternoon throughout South Florida. Expect periodic clouds mixing with sun throughout the day, as we’ll drift between partly and mostly cloudy. An isolated shower is possible with the chance of rain around 20 percent. Above average highs are forecasted with thermometers peaking in the lower 80s this afternoon. It will likely remain dry overnight as another batch of inland fog develops late. 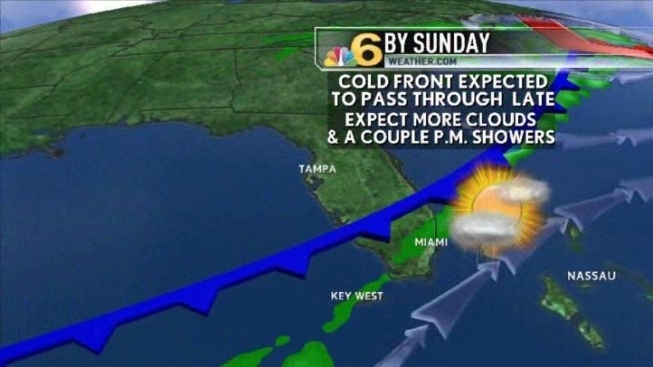 South Florida will fall into the upper 60s by early Saturday morning, as the day will stay mainly dry with low shower chances. Partial sun is expected with a high of 82. This will be the brighter day of the weekend. Sunday will start around 70 and warm into the mid 80s and will be warm and muggy. A cold front will move through the area in the afternoon or evening, triggering widely scattered showers locally. Sunday will not be a washout, but there will be more clouds and a greater chance of a shower than earlier in the weekend. The day is still fine to keep outdoor plans, just be ready for a few late day showers.